“The future has a name and that name is hope,” Catholic Education Diocese of Wollongong director Peter Turner told more than 800 staff gathered at this year’s Diocesan Education Mass. Held during Catholic Schools Week earlier this month, the Mass saw Catholic educators from across the Wollongong Diocese come together at St John Vianney Co-Cathedral in Fairy Meadow in a strong statement of unity and spirit. “The 26,000 young people who walk through the gates of our diocesan systemic and congregational schools for nearly 200 days in 2019 – they are the reason why this Church is filled to capacity tonight,” Mr Turner said. “In 2014, Pope Francis called education an act of love. He went on to say, ‘The educator in a Catholic school must be, first and foremost, competent and qualified but, at the same time, someone who is rich in humanity, capable of promoting human and spiritual growth’,” Mr Turner said. He concluded his address with the official launch of CEDoW’s new Lighting the Way Vision and Strategic Direction 2019-2022 document, and its symbolic handing over to Wollongong Bishop Brian Mascord. “This plan outlines our responsibilities in faith and learning, and how we intend to deliver on these intentions. 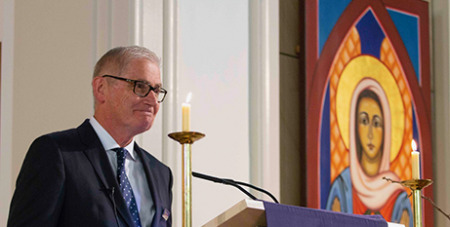 The work is founded on the myriad of values espoused by Jesus in the Gospels, but with a focus on four: integrity, justice, compassion, and that chosen as our theme for 2019 – hope,” Mr Turner said. The Mass was also an opportunity for the diocese to contribute to the Show the Love for Townsville appeal and show communal support for the students, families and staff from Catholic school communities in and around Townsville who were affected by worst floods ever recorded in the region last month.